Smart Money Daily says that winning the lottery is a “one-way ticket to misery” … and, I couldn’t agree more! I’ve read that 4 out of 5 lottery winners are worse off 5 years after winning the lottery than they were before. The problem is that you have to make your money slowly in order to learn the rules of money that allow you to keep what you have. I remember receiving my first multi-million dollar check; I flew to Melbourne from the US to personally bank it – after ‘watching’ it flow through the right channels. I remember worrying that the personal bankers might have just printed up fake bank business cards and rented a fake office just to rip me off! By the time I received my next two checks (one of them just as big at the First Big One), I just let my accountant bank them for me … it’s amazing how your mindset can change so quickly. So, it’s no great surprise that some of these people simply trust others with their money. 1. When you sign the contract for $X per year, realize that you DON’T have 80% – 120% of $X per year to spend! 4. Take 5% of that ‘accumulated’ Number and that’s the amount that you can afford to spend in any one year ‘living’ – starting now …. period! – Cars and Other Possessions: always pay cash for these, and put no more than 5% of your expected ‘Number’ into them … since you will most likely enjoy spending, spread the 5% over the number of years that you expect to achieve your Number. Still, to be safe yet keep up pretenses, simply rent the house (that’s where the 25% Rule comes in; i.e. don’t spend more than 25% of your after-tax yearly earnings on rent and other direct housing expenses) and cars until you’re pretty sure that you will actually achieve your Number … or, be prepared to downsize pretty quick if something happens (e.g. sport injury). Oh, and forget the blood-sucking entourage! Interestingly, I have no rules for your first home, other than not breaking the 25% Income Rule (this video talks about 28% … my rule is post-tax, but this video doesn’t specify whether it’s pre- or post-tax), so it may be worth listening to what this guy has to say. However, once you are in your first home, in my opinion, you have “entered the race” and that’s when my 20% Equity Rule and 5% ‘other junk’ Rule kick in to help you ‘win’ the race to your Number by not over-investing either in your home or in your ‘other stuff’ (incl. cars). 7million7years in the 'news' again! Kimberly Palmer wrote an excellent piece for US News (and, reprinted by Yahoo News!) called 10 Secrets of Millionaires’ Money Management and the first cab off the rank is 7million7years! I’ll let you click on the link to read the article in its entirety. I’m writing a story on “secrets of millionaires” and would love to include some of your thoughts — could you please share two to three of the strategies that worked for you, perhaps things you’ve written about on your blog before? Two or three strategies that could be counted as a ‘secret’ to becoming a millionaire? 1. The Number One secret of being a millionaire is not an obvious one, but it’s the absolute key: you need to know your Number i.e. how much is enough FOR YOU. For most Gen-X and Gen-Y’ers, retiring with a couple of million when they are 65 won’t be anywhere near enough to maintain even an average lifestyle because that little pup called inflation is constantly nipping at your heels as you try to run towards building your own retirement nest-egg. You need to be aiming for a MINIMUM of $3 million+ in 5 to 10 years to even be considered a ‘bare bones millionaire’ these days. 2. The second secret is also counter-intuitive but equally powerful: when you get to your Number STOP and live your Life, you deserve it. For example, if you have a business and somebody offers you enough money to meet your needs for the rest of your life, then – as long as the offer values the business reasonably – TAKE IT. Don’t get greedier 😉 by rejecting the offer looking for more. And, don’t be tempted to start again – lighting doesn’t often strike twice and who knows when the next recession (or other disaster affecting your business e.g. fire, departure of a number of key employees, etc.) will hit? 3. The final secret is to learn the lessons of money early and stick to them. For example, know how much capital to have invested in your own home, in your cars and in your other possessions, learn how much you can safely borrow, learn how to live within your means, and learn how to delay gratification; these are the habits that you need to maintain on the way up, so that you can keep your millions when you get there. If lotto winners can spend their winnings in just 5 years and end up broke and athletes and celebrities such as MC Hammer, Elton John, and Evander Holyfield can spend their huge fortunes, your paltry few millions can easily disappear much faster than it arrived. Yesterday’s post was about Suzy Welch’s “life transforming idea” (her words, not mine) about the Power of 10-10-10, which I believe can be applied to financial decisions as well. How do you know WHEN something is a ‘major financial decision’ worthy of asking Suzy’s Three Big Questions? If you’re on a low-to-average income, or still well-entrenched in Making Money 101, then you may want to replace each ‘$1..’ with a ‘$3..’ but, if you’re super well-off, then you just start adding zero’s to the dollar amounts to suit! … chances are you won’t. 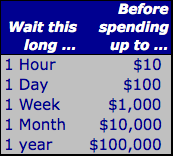 Think about even the small expenses that you may be tracking, if you keep a budget; take a glance down the list for even one or two random days and see how many you would have not bought (or bought less of, or fewer of, or the cheaper one of, etc.) had you taken even 10 minutes ‘time out’? (b) ask yourself Suzy’s 10-10-10 questions. Well, when the ML Mercedes first came out, I simply HAD to have one of those [squeal] little SUV’s that drives like a car … after some self-imposed ‘time out’, I decided that I really didn’t need the car right now. Sure enough, the burning desire to buy the car – right then and there – dissipated to the point that I forgot about it; sure enough, a year later the opportunity fell in my lap to buy a factory executive-driven vehicle (genuine … I bought it directly from Mercedes Benz head office), virtually no miles on it, for $11k off the best dealer price that I could get. Are you carrying expensive debt? Sometime ago, I uploaded a video that explains my unique debt repayment strategy – after all, EVERY self-respecting ‘finance guru’ has one these days 😛 – and, I wrote a follow-up post explaining the concept of ‘expensive debt v cheap debt. Now, read the post and reread the post. It took me a couple times to completely follow. But, I will tell you that I am really glad I did. Why? Well, because it could end up saving me $35,328! Take a look at the interest rate on the debt that you are thinking of paying (e.g. 2.5% on a student loan; 5.5% on a mortgage / housing loan; 19% on a credit card debt) and decide whether you would be better off leaving that loan in place and investing the payments that you would have made instead. – Alternatively, if you are thinking of borrowing to buy an investment property, why would you pay off a 2.5% loan just to then take out a 6.5% ‘investment loan’? Oh, and if you are not thinking of buying an investment property instead of paying down any reasonable, low-cost (eg mortgage or student loan) debt … think again! – However, if you are carrying a 19% credit card debt, what are you thinking of: pay that sucker off ASAP! BTW: you may be wondering what the Debt-to-Income-Ratio pie chart on the top of the page has to do with anything? Now, I can’t comment on the first version, but I can on this one: even though Motley Fool suggests that it’s OK to carry 15% of your income in servicing ‘bad debt’, the ‘correct’ ratio of bad debt to income is 0% … you should carry NO bad debt. On the other hand, if you DO currently have ‘bad debt’ (eg consumer loans, car loans, mortgage – this one is in the ‘grey area’ between good/bad debt – or credit cards) then the correct comparison is how much expensive debt you should carry v cheap debt … the answer again, of course, is none.